Oh Boy this cake delivered! It truly lives up to it’s looks! The perfect celebration cake to ring in summer and Stephanie’s birthday. Another winner from Sky High Cakes with a couple of my own additions. It’s a mighty one too – weighing in at 10 pounds 5 ounces! It’s got a strawberry mousse filling, a cream cheese frosting and a strawberry coulis with Gran Marnier glaze on each layer. I don’t think I’ll add the glaze next time – it kind of got lost. The Cake – it’s dense and moist and no harm will come to it as long as you double wrap! I wrap in saran and put it in a ziploc. A cold cake is much easier to assemble. 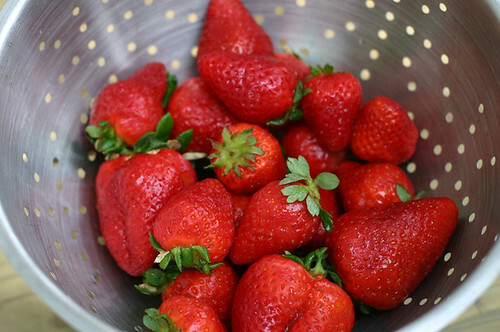 The Pureed Strawberries (need about 4 Cups) No recipe – just hull about 2 qts of strawberries and puree in blender. The Frosting– Basic Cream Cheese frosting – just bring it to room temp to frost the cake. You can make the Strawberry Mousse the day before. Preheat the oven to 350. Butter and flour three 8″ round cake pans. Mix to blend then raise the speed to medium and beat to light and fluffy – about 3 minutes. In three separate addtions add to cake batter. Blend after each addition until incorporated and wipe down sides of bowl. Pour into prepared pans – about 1# 9oz per pan. When geletined puree is cool mix in too then fold in the heavy whipping cream. I stored this in a ziploc bag overnight and it got nice and firm which is good for this dense cake – there was no slipping around of the layers when assembling. For this cake I used about 4 Cups of frosting. I usually make extra because it freezes well and I hate not having enough frosting mid-way through assembling a cake. You always have loved cakes. On this one, you’ve outdone yourself. I wish I could have a piece right now! Oh my! This looks and sounds amazing! What an amazing cake!!!!! I wish I could have a slice. =) Thanks for sharing. I am not a sweet eater at ALL. I don’t crave it and rarely, if ever eat sweets. 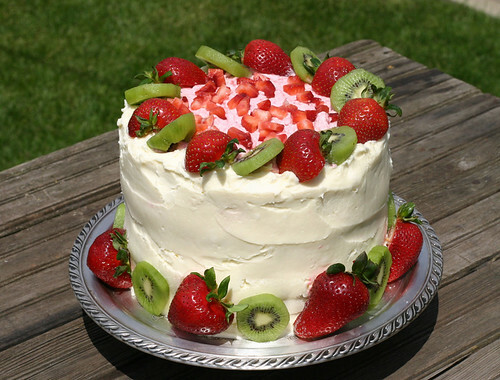 However, I think your cake is not only visually beautiful but you cannot go wrong with…*hello* butter AND strawberries! this is SO gorgeous, do you mind if i use this pic for the new food blog i started, with a link back to you? Sorry for opening up an old post but this looks (and smells) great! I’m in the process of making this right now! I had to do everything by hand, no mixer, no blender (used a potato masher on the strawberries.) But there was a huge strawberry sale at my neighborhood grocery store, so i couldn’t resist. I’d be happy if it comes out half as nice looking as yours, becasue yours is really quite lovely. I work at a restaurant and one of our guests brought this cake for her sister’s birthday. All of the servers were eyeing this cake it looked soooo good. After we sung happy birthday I couldn’t help but ask for a piece. This is the best cake I have ever eaten. Thanks for sharing! 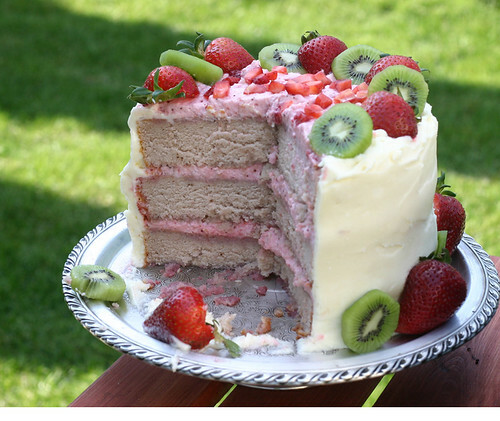 I’m in the process of making this cake right now :)….I’ve baked the cakes and when I get back from work i’ll be doing the frosting, mousse and assembling!!! So sorry! I hope I got to you in time. You’re going to love this cake, I need to make it again, it’s been too long. Enjoy Megan! I’ll let you know how everyone likes it!